HTC One is at the new Android Jelly Bean powered device which has been recently made available to AT&T Customers. AT&T customer rejoiced the Apple iPhone like earphones and few other advantages on the AT&T HTC One which was quite better than the international package. But some customers are complaining about the carrier bloatware and unnecessary apps preinstalled by AT&T. We would suggest users to root the device, if you want to get rid of bloatware and other unnecessary apps from your AT&T HTC One. Once rooted your device you can install any of the ROM that are developed for faster performance and better battery backup. Some of these ROM developers have successfully removed most of the junk apps on HTC One. Note: What is custom ROM and why you should try one? Warning: Rooting and installing custom ROM is a non recommended procedure by Google and HTC. There are risks and advantages with rooting and you should be aware of it. We should not be held responsible for any mis-happening with your device. Team Venom ViperOne ROM for HTC One– If you are a regular follower of XDA forum HTC One thread then you will be already knowing that Team Venom is developing some cool ROM for HTC devices. Now, they have come up with Android 4.4 Kit Kat and Sense 6.0 based ROM for AT&T HTC One. This is one of the most stables and feature packed ROM available for HTC One users. Team Venom has packed lots of action packed tweaks and settings apps. This ROM also works on Sprint HTC One Variant. Android 4.4 Kit Kat ROM for AT&T HTC One – FTS group has launched an Android 4.4 Kit Kat based firmware for AT&T HTC One users. Next sense ROM is working fine with Sense 5.5. It is working fine for now and no major bugs have been reported. If you are looking for Android 4.4 Kit Kat based then you should certainly try this ROM. Dirty Unicorns ROM for AT&T HTC One: Dirty Unicorn is a project based on the AOKP base, but now shifted to Omni ROM as base. The new ROM is based on Android 4.4 Kit Kat firmware and there are lots of features of customization. The ROM is stable and fluid and you will not face any glitches. There are no known issues yet, developer has included some of the most searched features like Moto X notifications, Color changing phasebeam and gesture anywhere. CleanROM for AT&T HTC One: If you are on XDA forum and have already used a Samsung or HTC device, you must be knowing recognized developer scrosler who is behind the CleanROM. Developer has recently launched CleanROM 1.5 for AT&T HTC One users. The ROM is fast, stable and clean. Most of the bloatware has been made optional so that you can choose which one to install using Aroma installer. THE ROM is zip aligned deodexed to enhance performance. The developer also claims to tweak ROM with some additional performance optimization. 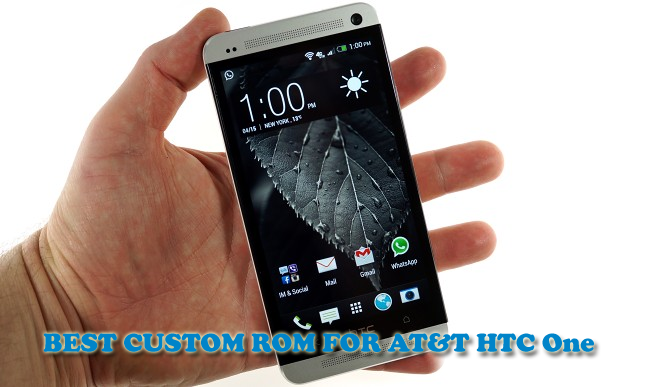 RageOne ROM for AT&T HTC One: RageOne ROM is developed by another xda forum senior member, the team has Deodexed and debloated the ROM. The ROM is pre-rooted, features some UI and performance tweaks like scrolling smoothness, DSP manager, PIE control, battery saving tweaks. This ROM is good if you don’t want to loose HTC Sense UI. CyanogenMod 10.1: Everyone loves AOKP based CyanogenMod ROMs. The CM team is working to build a properly working stable CM10.1 build for HTC One. This Android 4.2.2 based ROM is still in alpha stage and we do not suggest normal user, to try this ROM as voice calls and camera are not working. The developers have promised that a stable version will be released within a month. If you choose to install this ROM then make sure you try the best cyanogenmod themes. If you do not want to install ROM and just want to remove AT&T bloatware apps then there is flashable script that will remove all the bloatware with just one click. Check AT&T HTC One bloatware removal script.